Kris Bryant has rejected a long-term contract extension offer from the Chicago Cubs worth at least $200 million, according to multiple reports. An MLB.com report on Wednesday said Bryant, in the last few months, turned down an offer "in the neighborhood of $200 million." ESPN's Dave Kaplan said on ESPN 1000 in Chicago that the Cubs reached out to Bryant with an offer for a larger contract extension. "Whispers are telling me that the Cubs approached (agent) Scott Boras to do a massive extension with Kris Bryant in the last several months," Kaplan said. "And it was turned down by Bryant and Boras. "I was told that the Cubs' offer was more than fair, well north of $200 million. Not enough." 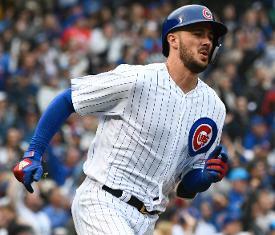 Bryant, a 26-year-old third baseman and outfielder, won the National League Rookie of the Year in 2015 and the league's Most Valuable Player award the following season, when the Cubs won the World Series. He is under club control through 2021. He earned $10.85 million in 2018, the most ever awarded to a first-year, arbitration-eligible player. He is eligible for arbitration for three more years and won't hit the free agent market until 2022 and age 30. Because of a lingering shoulder injury, he appeared in just 102 games in the 2018 season. He had 13 home runs and 52 RBIs and hit .272, all career lows. In his MVP season, he hit 39 home runs with 102 RBIs and a .292 average. This is not the first time that Bryant and the Cubs' front office have disagreed. In 2015, the Cubs kept him in the minor leagues longer than he wanted to have an extra year of control on his contract. Had they not, he could have been eligible for free agency a year earlier.